Having completed my first Marfy dress, I now have the pleasure of reflecting upon its creation. Unlike my “Ghost Dress” which caused me so much angst (but turned out okay in the end), this ‘60s-inspired design went together without a hitch, although it definitely took some “figuring it out” along the way. Somehow, the longer sleeves did not look good with the very distinct A-line silhouette of the dress. I thought they would look better with more of a straight skirt. 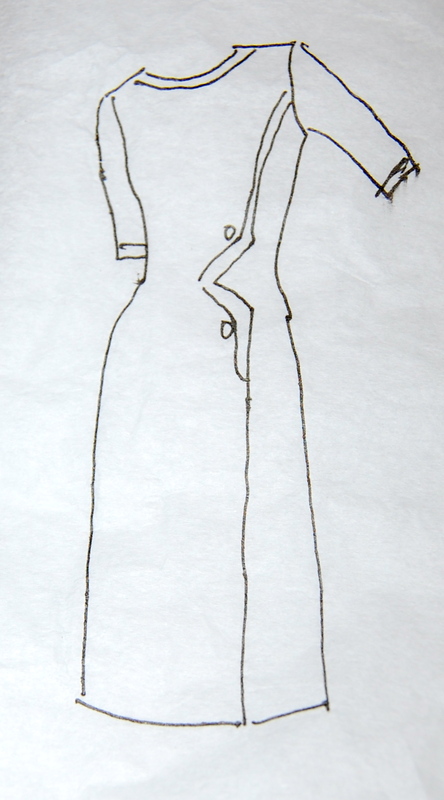 I knew from the muslin that the front detailing had a built-in kick pleat, so narrowing the skirt was entirely doable. I would still be able to walk in it! With no written and illustrated instructions to follow, I relied on my sewing knowledge and experience to execute the seaming on the front left of the dress. 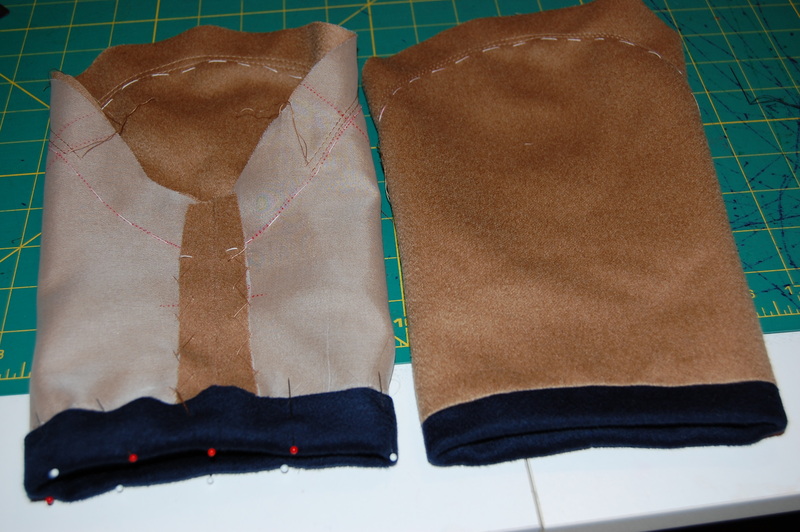 I was able to sew the seam by machine from the sleeve down to the lower angle of the point. From there down to about 8” from the hemline, I sewed the seam by hand. There is a pleat hidden beneath the dress here, and sewing by hand seemed to be the only solution. And here is the finished kick pleat. 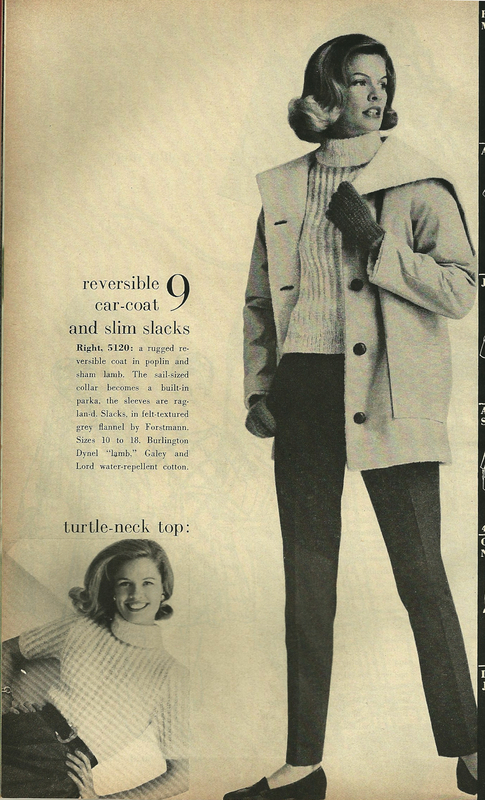 When it came to the sleeves, they are shown in the illustration with a contrasting band. However, no band was included with the pattern. I did a muslin mock-up to test the visual appearance of the width of the band. Because I had cut the sleeves with a slight curve to the lower edge, I had to make a muslin guide for the bands, which included the same curve. 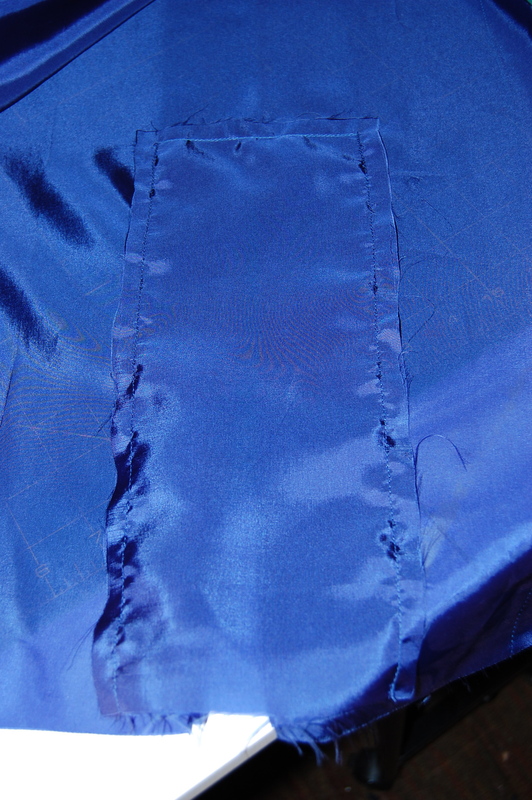 First I marked where I wanted the pleat in the lining to be. By the way, the lining is Bemberg rayon. I usually like to use crepe de chine for my linings, but I had this Bemberg in the right color, so I decided to use it. 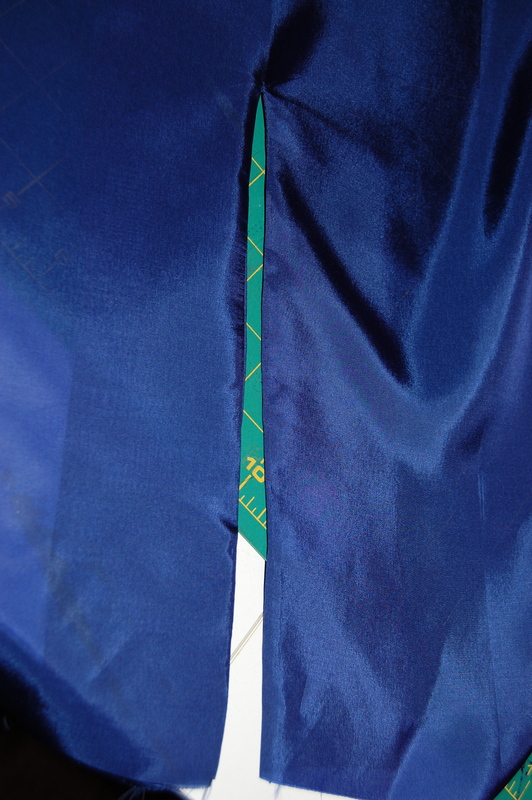 I centered a triangle of the lining fabric (about 10″ x 8″) on top of the marked line. 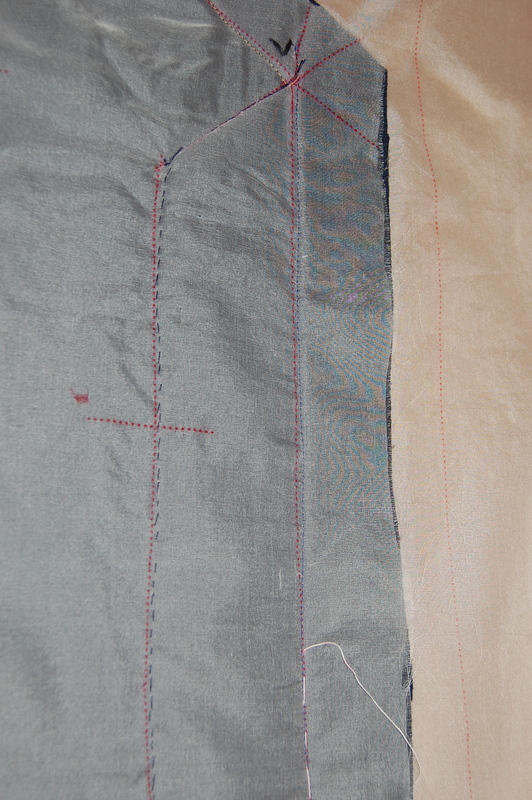 I stitched on either side of the marked line through both layers of lining, graduating up to a point at the top. 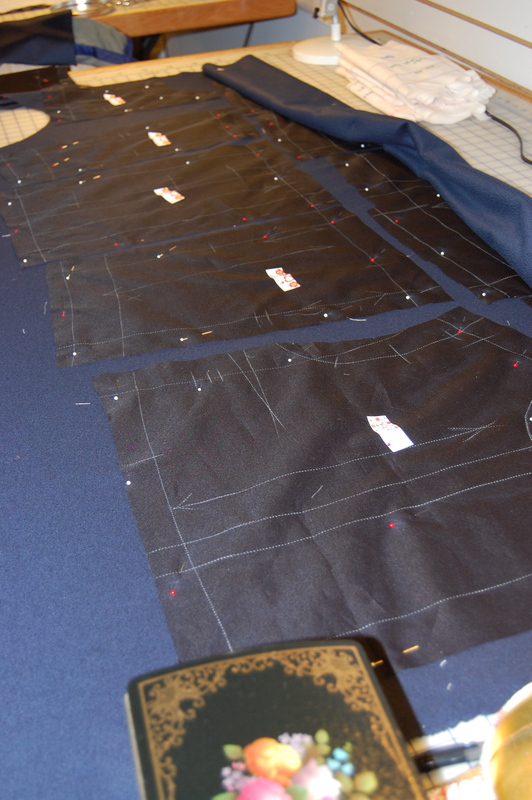 I cut along the marked line and turned the placket to the wrong side. 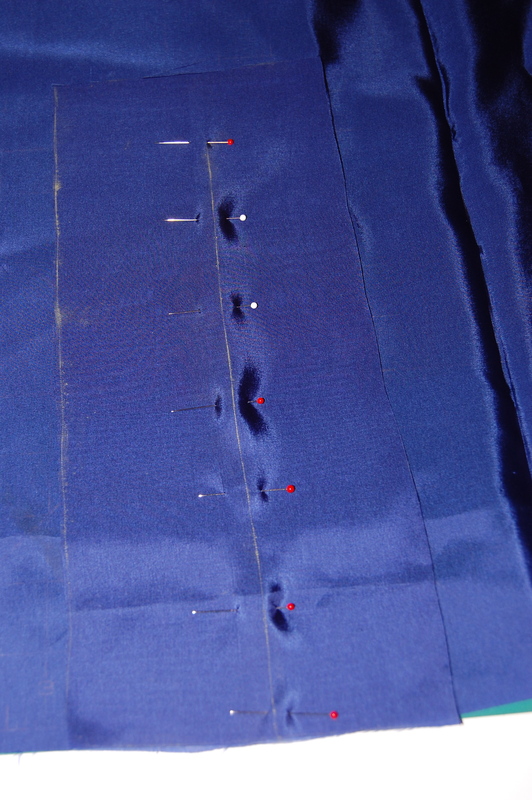 I sewed another piece of ling fabric (10″ x 8″) to the wrong side of the turned placket. 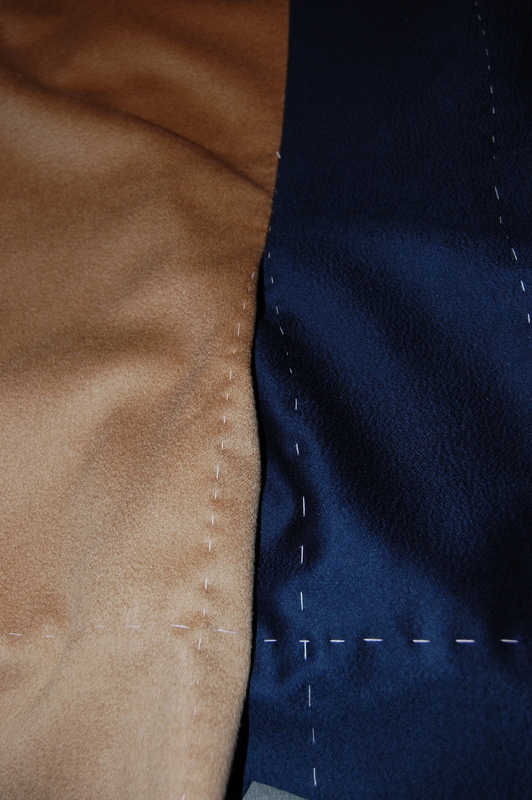 It is stitched around the edges in a 1/2″ seam. 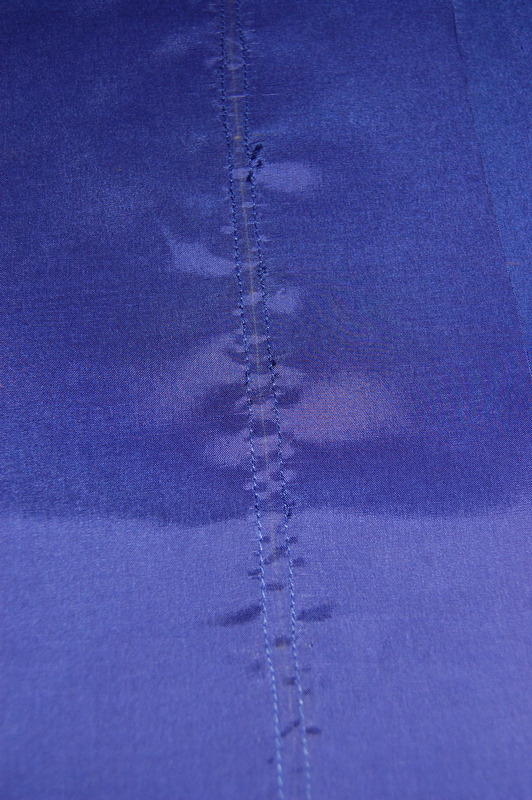 After securing these stitched-together pieces across the top through all layers, I had a kick pleat! 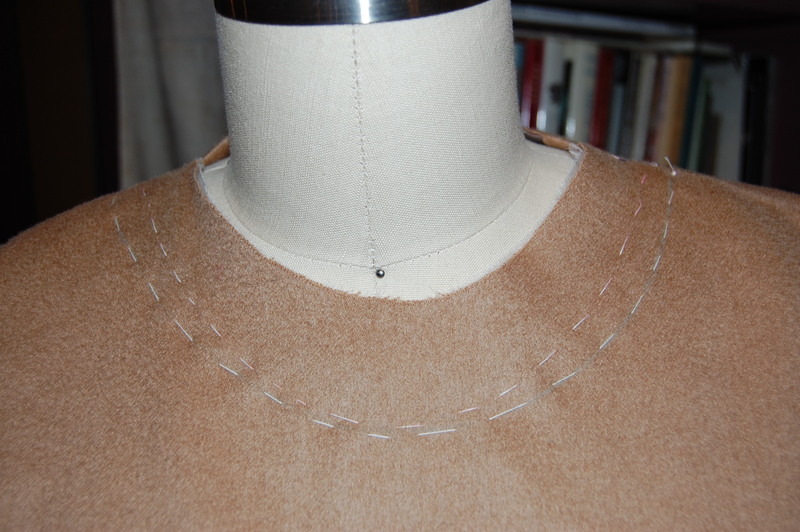 Back to the final part of the dress: the neckline. I still wasn’t sure I had a pleasing neckline, so I got out my French rule and re-chalked one with a little wider stance and depth. For the top-stitching around the neck and around the angled detail on the front, I did what I did with my jacket out of the same fabric: I hand-picked it. I am so happy with how it looks. It’s very subtle, but adds just the right emphasis. The buttons are smaller versions of the (concealed) buttons on my jacket. 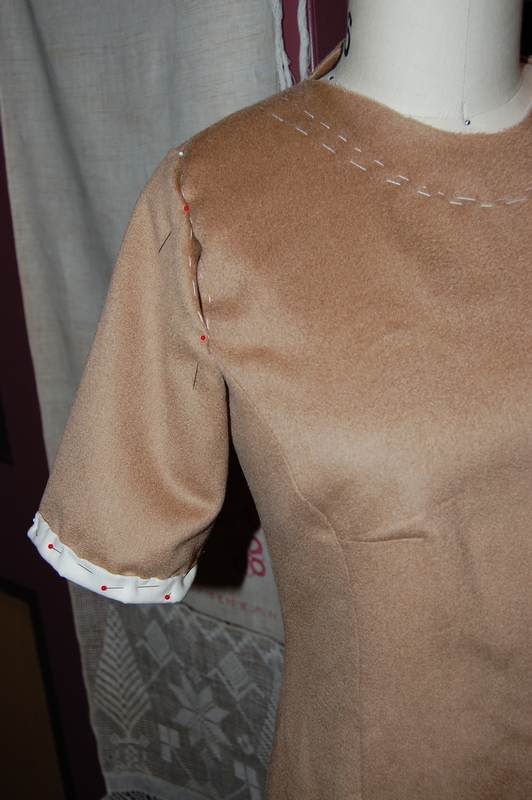 I set the lining in by hand, under-stitched the neck-edge by hand, and finally the dress was complete. And of course I have to show it with the coat! It is probably unfair to do an assessment of Marfy patterns after just one make, but I’m going to anyway! The things I really like, so far, about using a Marfy pattern are 1) its preciseness, 2) the individually sized patterns, 3) the pattern pieces without seam allowance added. And is there anything I dislike about Marfy so far? Yes, one big thing! I really miss having a pattern envelope with an illustration, variant views and back views. 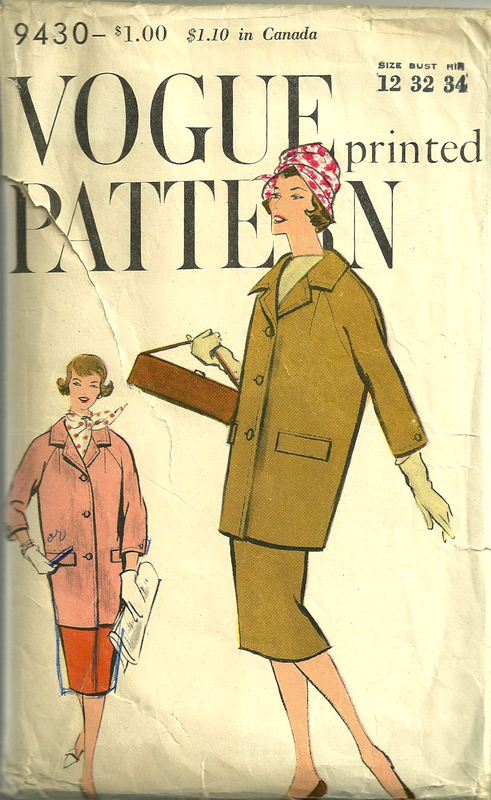 I am so accustomed to vintage patterns, most of which sport envelopes which are like small works of art. There is so much pertinent information on them (fabric suggestions, zipper sizes, garment descriptions, thumbnail pattern piece diagrams, etc.) and even wearing suggestions. 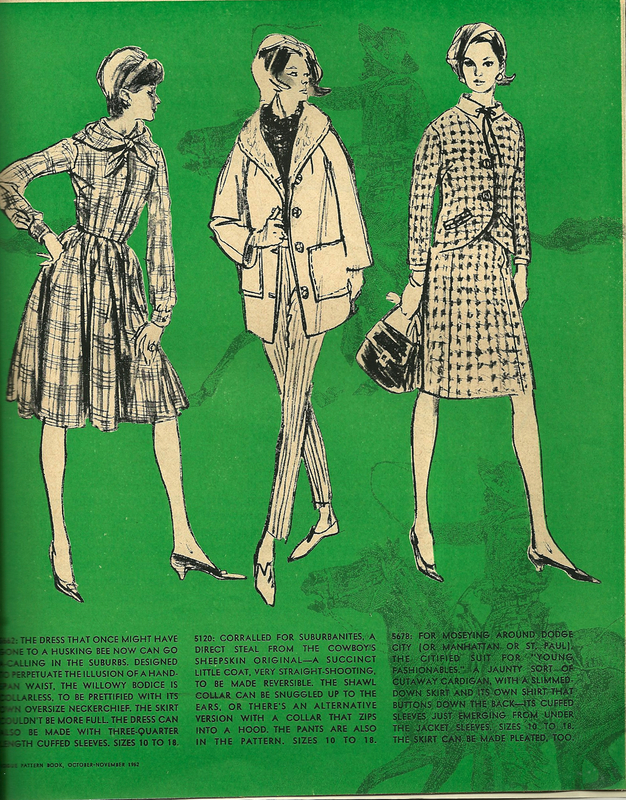 The illustrations show outfit styling suggestions (hats, handbags, shoes, etc.). I love studying them. So, yes, it’s true – I feel like something is lost without a pattern envelope for this dress which I like so much. I won’t be waiting long to wear this dress. Our American holiday of Thanksgiving is this Thursday, and Marfy will be one of my dining companions. To my fellow citizens, may the day be as meaningful and blessed for you as it always is for our family. To all my readers around the globe, my thanks to you for sharing your love of sewing with me! Actually, the handbag I took to San Francisco was small, tucked inside a larger tote bag – so that I could use my allotted “carry-on” space for an extra suitcase for fabric purchases. Off I went on February 1st for Susan Khalje’s Couture Sewing School held at The Sewing Workshop in San Francisco. I had carefully packed myriad sewing supplies and my prepared muslins, hoping to be ready for any contingency. Little could I have known that while I was to be sewing on the West Coast, the camping out (or really, camping in!) and the emergencies would be on the East Coast – with the county in Pennsylvania where we live especially hard-hit by a devastating ice storm. Our house was without power for 5 days, and knowing that my husband was dealing with downed trees, downed power lines, blocked roads, confused pets, a house getting colder and colder with each day, and limited means of communication, weighed on me mightily as I worked away on my color-blocked jacket. Most of us in the class needed to purchase all our fabric or coordinating fabric or supplies for our intended projects, so off we went to Britex Fabrics on Monday after Susan had fitted most of our muslins. 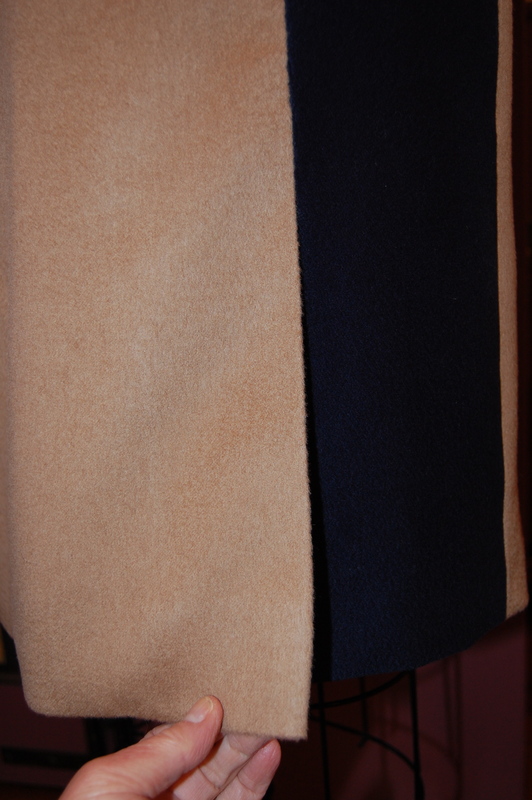 I had thought long and hard about what color combination I would like to have for this coat. Knowing that many, many hours of work would go into this project, and also realizing that this jacket could be a go-to piece of outerwear if I chose my fabrics carefully, I decided to look for more conservative colors. So – no hot pink and apricot orange, at least this time. Britex carries an extensive selection of coating wools, so much so that it is definitely advantageous to be helped by one of their incredibly knowledgeable sales assistants. I was fortunate that Inna, who has such a trained and talented eye for color and texture, was able to assist me. 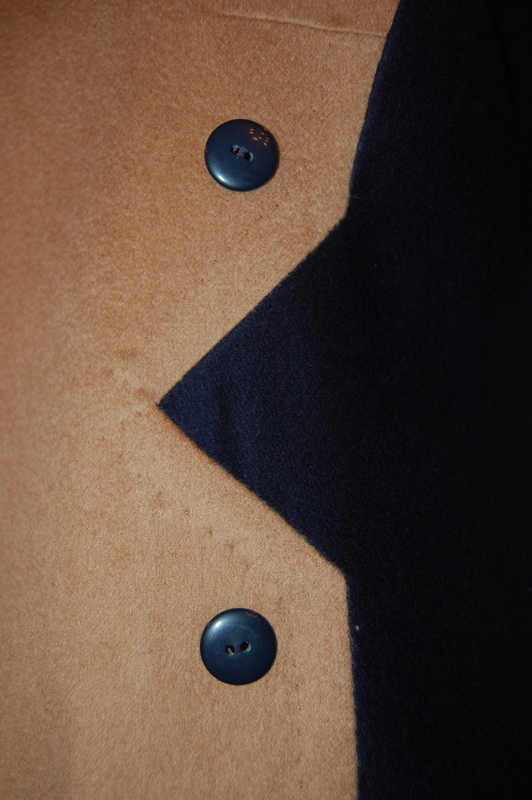 We started with a lovely camel hair coating wool, which had a napped silky sheen on one side and was just the right heft for outerwear. First I wanted to look at pairing it with gray, but nothing in the gray family seemed to strike my fancy. Then we moved on to the navy blues – and there nestled in among the bolts was the perfect “medium” navy blue, also with a napped sheen on one side. It was a little heavier than the camel hair, but Susan felt confident we could make the two fabrics work together, especially because their colors complimented each other so perfectly. Silk lining fabric was next on the list, and I wanted something figured rather than plain. Inna pulled out a bolt of Italian charmeuse, which picked up the geometric feel of the jacket, and introduced a little red into the mix. I couldn’t be happier with it. I am not so sure this photo gives the best sense of the colors of the fabrics, but you will see more in other photos. Back at The Sewing Workshop, armed with fabrics and enthusiasm, I spent the next two days cutting out the multi-, multi-pieced pattern (31 separate pieces, all of which would be cut in tandem, making 62 in all, not including the lining! 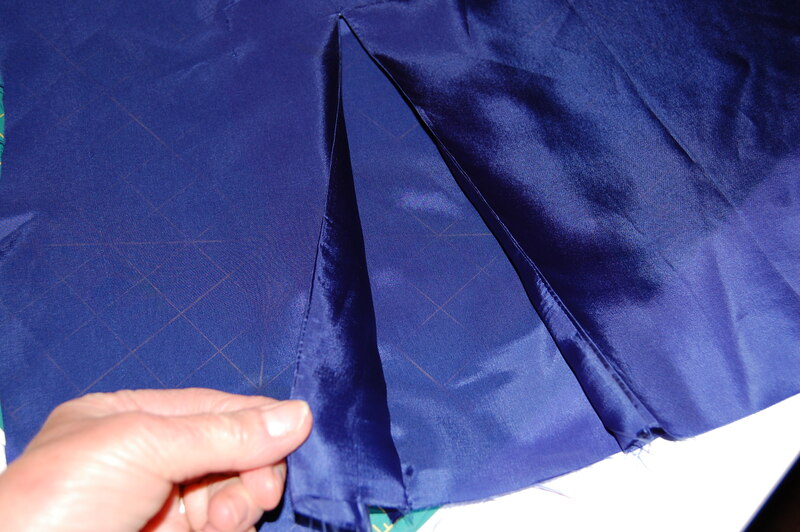 ), and basting the silk organza underlinings to each and every piece. My well-lit and spacious work space at The Sewing Workshop. Because of the color blocking, I needed to pay great attention to which piece was to be cut in blue and which piece in camel. 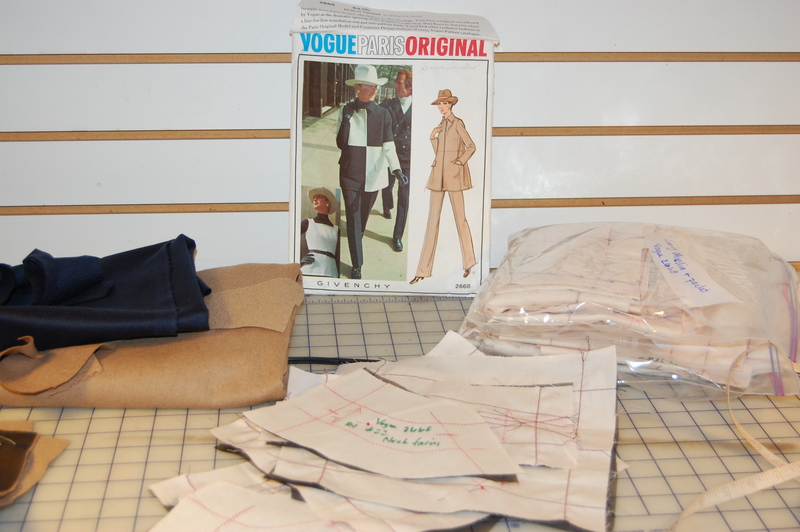 Initially I went through and labeled each muslin piece “navy” or “camel”. Susan double-checked me, but then suggested that, because I absolutely could not make a costly mistake, that I pin the muslin pieces onto the available dress form in our studio. What a great idea, one of so many which I picked up from Susan and my classmates! 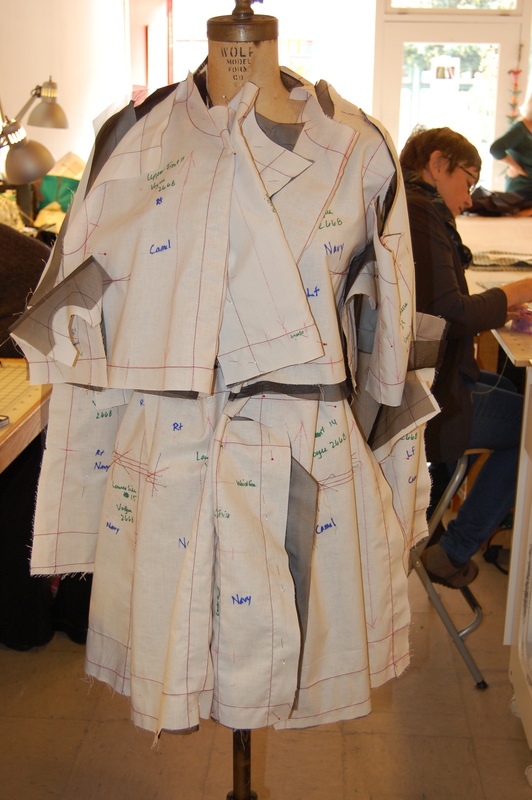 Here is the “front” of the jacket, pinned onto the dress form. Now, I felt confident and set about to cut my fashion fabric. 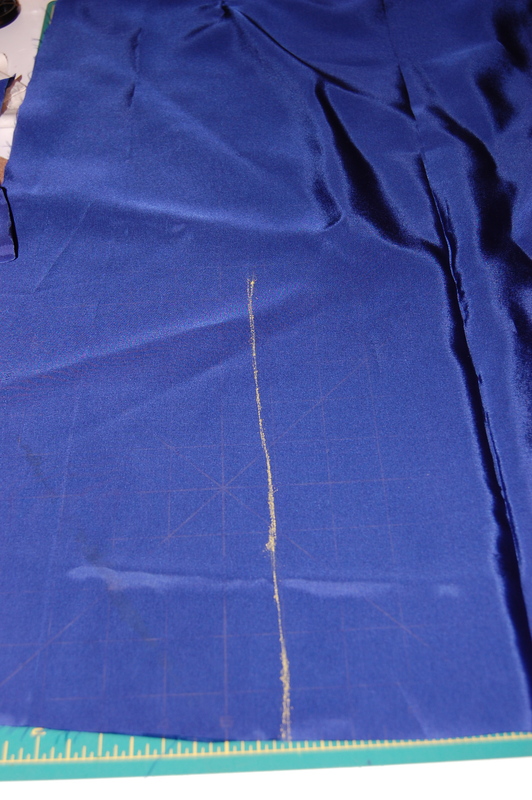 Here are the silk organza underlining pieces arranged on the blue fabric. I pinned a small tag on each piece, telling me each piece’s pattern number and description. A lot of the pieces look alike! 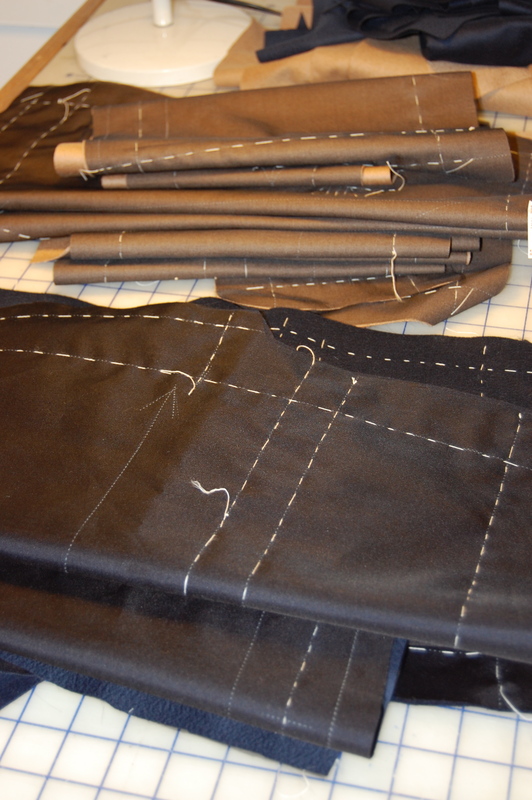 Two piles showing all underlinings basted onto the fashion fabric. By this time, I was half-way through the 6-day class. 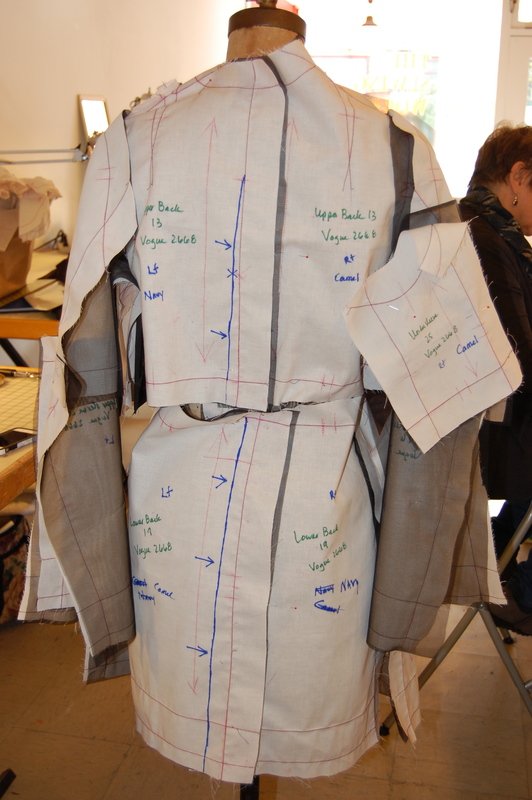 I assessed my situation and determined the parts of the jacket construction upon which I wanted to get expert advice from Susan: treatment of the concealed fly front, flap pockets, rolled collar (all of which will be detailed in a future post). Now I had a plan, which seemed to be much more than anything that was happening back home in Pennsylvania. My husband joked during one of our few cell-phone conversations, that he had a vision of the power in our house coming back on Sunday evening, February 9th, as he would be driving me home from the airport in Philadelphia. He was right. That is exactly what happened. I came home to a 39F degree house, but the lights were on, and soon the heat was, too. Almost a week later, it is still snowing and snowing – perfect sewing weather for this sojourner home from San Francisco. 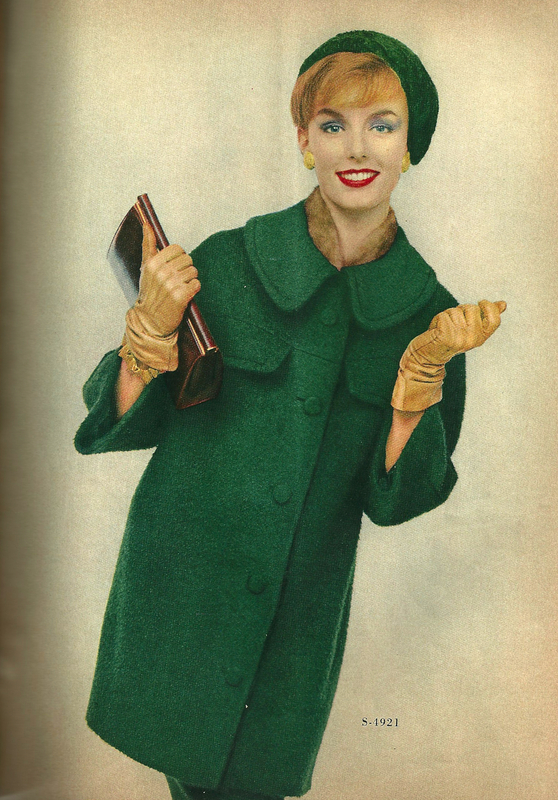 Shown in “boxwood green mohair,” this coat would be quite stylish in 2013. 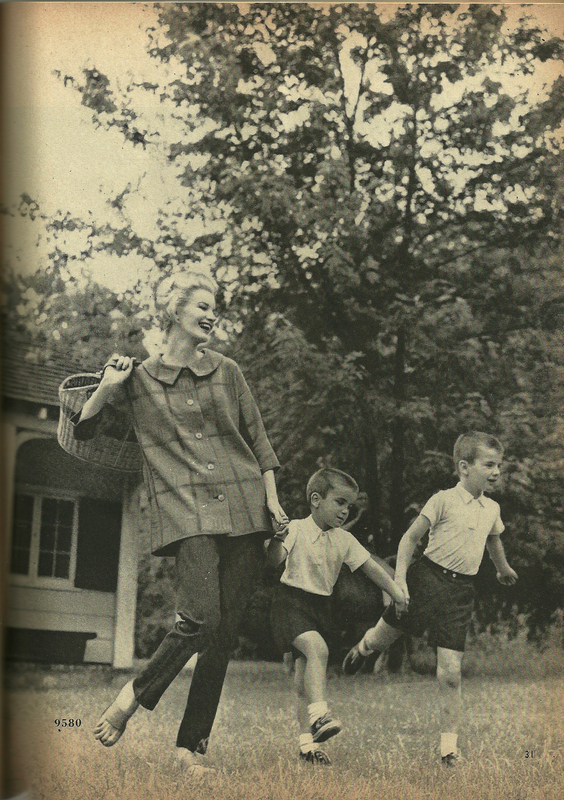 This “smock” coat has a pleat in the back for ease of movement for the busy mom. 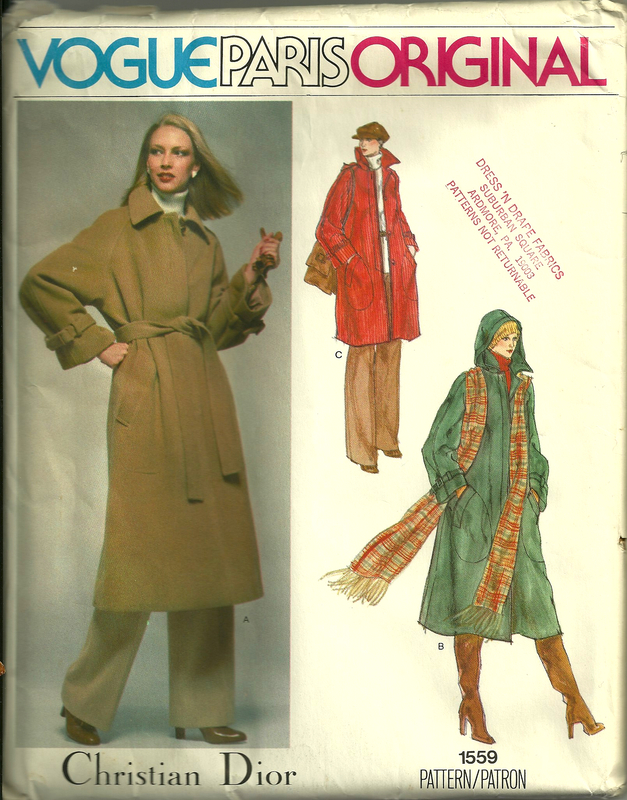 This pattern was for a reversible coat, shown here in poplin and sham lamb. The collar can be turned into a hood. Click on the image to see the details. 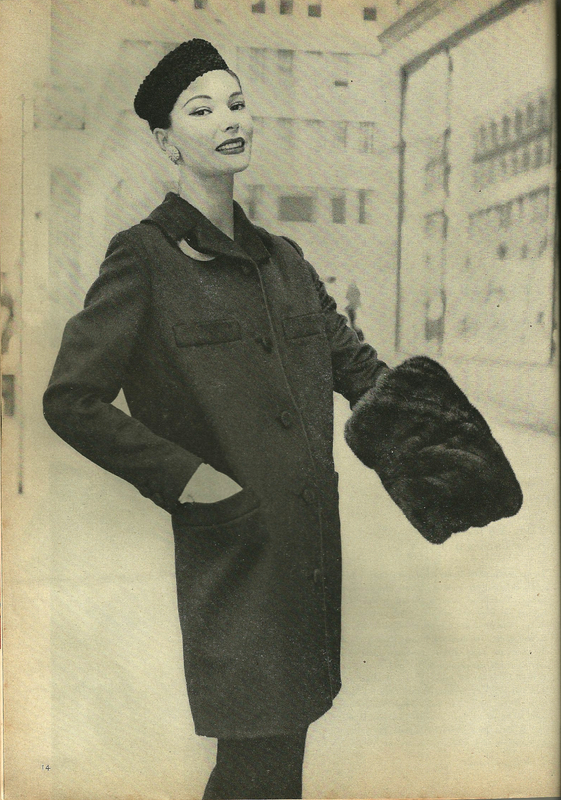 According to Fairchild’s Dictionary, Yves Saint Laurent used the classic U.S. Navy peacoat as inspiration for his variation of it in the 1960s. This is a good pattern to have in my collection – I just may need it someday! 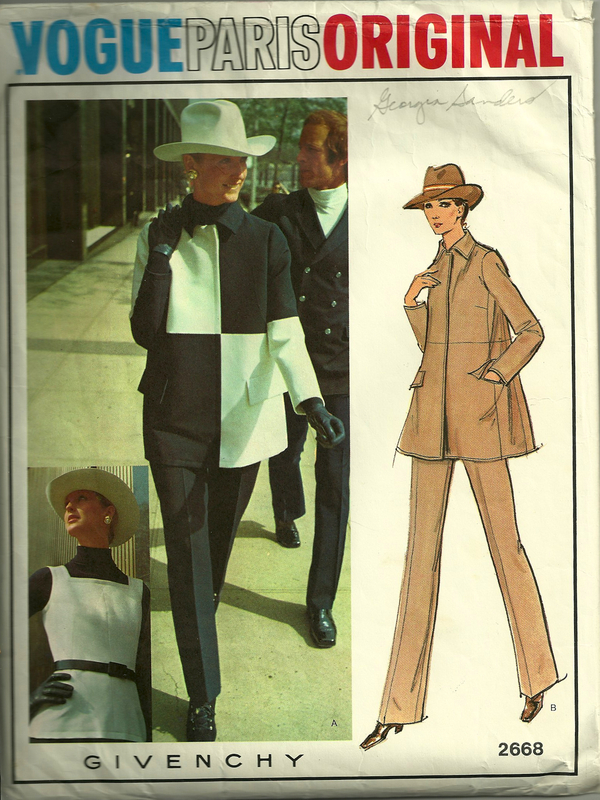 Back in the 1970s, I purchased this Christian Dior Designer pattern, with intentions of making the “below the knee” version, although a nice variation of a stadium coat is also featured. 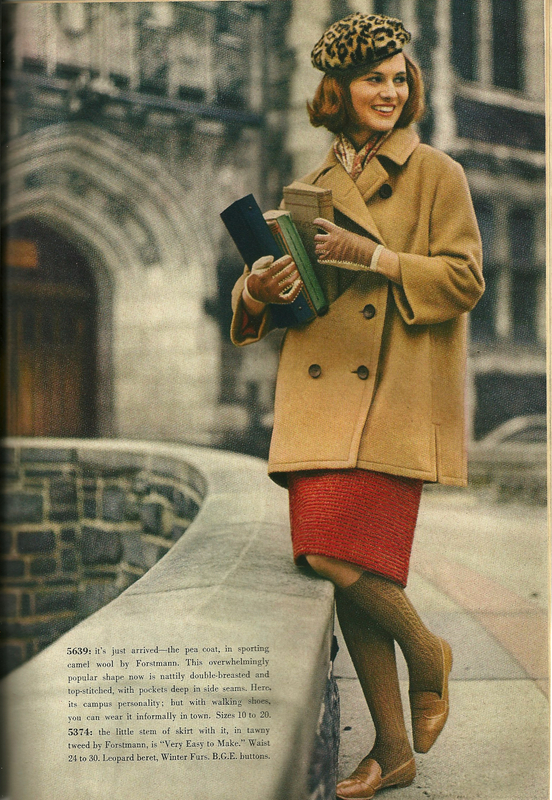 I still love this coat, in both lengths – and someday I hope to finally make good on my intentions! The buckles around the sleeves add a great look to this coat. I will definitely be doing the color blocking version when I make this coat. Purchased last August, this pattern sometimes keeps me awake at night. With Dior’s words imploring me to be practical, I wonder – – – should I make it in navy and white (as pictured), in black and white, in red and black, in gray and camel, in orange and gray, in ??? and ??? Still to be decided . . . but you haven’t seen the last of this pattern.